Has this ever happened to you? You’re about to meet or speak to a customer, a new colleague or even somebody in your social life, and someone else describes this person to you. Let me give you an example of what I mean. I was running a seminar at a client’s office and I was discussing the arrangements for getting into the building and finding the training room with my contact, Steve. He explained that I had to check in with the security guard at the reception desk. ‘You’ll not get much help from him,’ says Steve. He’s a typical security guard, a grumpy old so ‘n so and he won’t be much help. My first response, when I arrived at the office, was to prepare to do battle with this typical security guard. However, at the last moment I checked myself, and decided to practice what I preach. I approached the security guard, told him who I was in a warm and friendly manner, and asked for directions to the training room. John, as his name badge indicated, said that he’d need to make a few phone calls to find out where my room was. In between these calls, we exchanged some small talk, and even managed some comments about the local football team’s performance the night before. Initially, John was a bit grumpy, but after a while he warmed up, and ultimately, couldn’t have been more helpful. I treated him with respect, I spent time getting to know him, and I expected him to respond in a helpful manner – and that’s how he responded. Steve, of course, had this thing in his head about typical security guards and treated John accordingly. He expected John to be grumpy and unhelpful; so that was how John responded to him. People will often respond just as you expect, it’s a self fulfilling prophecy. So if you’re about to meet someone new, do not let other people decide your behaviour. You have to decide who runs your mind; is it you, or is it somebody else? 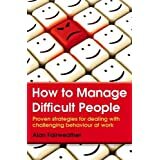 This entry was posted in Customer service, difficult people, relationships and tagged Alan Fairweather, Assertiveness, Behavior, Body language, Brain, communication, confidence, Critical thinking, Customer Management, customer service. Bookmark the permalink.